Abstract expressionism? Yoko Ono? In a picture book? Of course! Would we expect anything less? 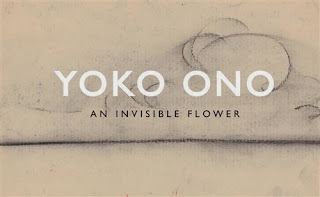 An Invisible Flower is the height of abstract expressionism. A manuscript written by Ono when she was just 19 years old, it was the artist's son Sean who discovered the work 'sticking out from the mouth of some old books like a tongue' at his mother's home. Upon reading the work, Sean was struck by the story's plotline, which seemed to be about his dad John Lennon (the book features a character named Smelty John), yet the story had been written some ten years (1952) before his parents even met. This fact alone is enough to goosebump the skin. An Invisible Flower is a beautiful work, with a gentle haunting quality that will intrigue children. Its pages are dusted with smeared charcoal sketches that might not, on the surface, appeal to the general picture book market, however, I feel we can't underestimate kids and their ability to see deeply into imagery that's not popping with cutesy colour. The text--about a flower that no one, except Smelty John, can see--is minimal but tenderly written and the accompanying imagery playful and childlike. The book's storyline is borderline existential but what I love most about this book is that the content remains true to the author while remaining accessible to children.